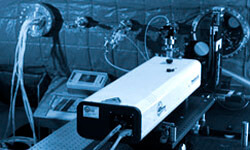 4D PhaseCam Twyman-Green interferometers are the industry standard for measuring concave primary mirrors. Vibration insensitivity enables measurements across long standoff distances without isolation. 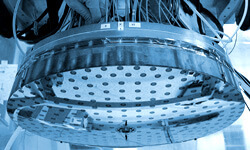 Unique instruments like 4D’s PhaseCam MW makes it possible to align mirror segments to sub-wavelength tolerances. 4D PhaseCam Twyman-Green interferometers and AccuFiz Fizeau Interferometers provide vibration-insensitive measurement of concave secondary mirrors. NanoCam Sq measures roughness directly on the optic or on robotic positioners to ensure surface quality at every stage of polishing and coating. PhaseCam< systems can measure modal response to input signals and external vibration to verify control systems for adaptive optics, to verify and calibrate the response of the actuators. Unique instruments like 4D’s PhaseCam MW makes it possible to align mirror segments to sub-wavelength tolerances. 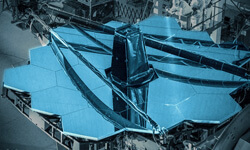 The James Webb Space Telescope (JWST) project required a method to verify alignment of the segments of the primary mirror, which are folded for launch, to within sub-wavelength tolerance upon deployment. The initial misalignment between segments is much greater than the measurement range of a conventional laser interferometer. 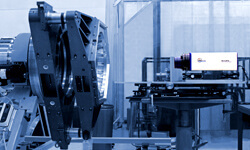 The multiple-wavelength PhaseCam MW Dynamic Laser Interferometer was developed to align mirror segments. The much longer “synthetic” wavelength generated by the interferometer is capable of measuring segment misalignment. As the segments are brought closer to alignment the wavelength is stepped down for increasing resolution. The European Extremely Large Telescope (E-ELT), being developed by the European Southern Observatory (ESO), will also feature a segmented primary mirror, an amazing 39.3 meters in diameter. To create it, more than 800 1.5 meter hexagonal segments will need to be ground, polished and assembled. Zeeko Ltd. is a UK-based manufacturer of seven-axis robotic polishers that have been used in the production of some of the E-ELT prototype segments. Zeeko selected 4D Technology's laser interferometers for its polishing metrology. Their compact size and insensitivity to vibration enables 4D interferometers to be permanently installed above the polishing station, allowing full-aperture metrology of the surface and greatly reducing cycle time and protecting the optics from handling damage. To measure the entire optical surface, the laser interferometer may need to be positioned far from the test piece—in some cases tens of meters away. Turbulence over such a large cavity can significantly distort the phase data, and airflow control systems of this scale are either expensive or impractical. The presence of vibration is difficult to isolate in long path test setups as well. 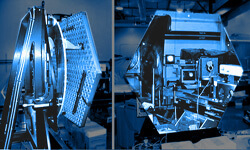 4D’s PhaseCam dynamic laser interferometers are used by the world's premier large optics manufacturers and telescope integrators to ensure excellent performance after installation. Their ability to measure optics despite vibration and to thrive in environments with significant turbulence makes 4D laser interferometers perfectly adapted to long stand-off measurements without vibration isolation. Quality assurance measurements for optical grade surfaces are typically made in a tightly controlled quality control lab, with vibration isolation tables, expensive air handling equipment and careful temperature control. Instantaneous laser interferometer measurement, made possible through 4D's Dynamic Interferometry® technology, brings measurement right to the optical shop floor, despite vibration and turbulence. Production floor measurement saves handling time and reduces the risk of damage to optics during handling, for highly efficient process control and quality verification. A clean room is a harsh environment for quality control measurement. 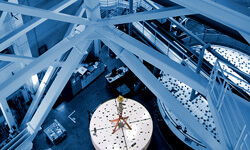 High air flow and vibration from pumps demand the use of isolation tables and air flow control. But with every square foot of clean room space at a premium, these added measures become expensive. The cost of moving optics in and out of a clean room for measurement can also be prohibitive. Instantaneous measurement, made possible through 4D's Dynamic Interferometry® technology, makes it possible to measure in clean rooms despite vibration and turbulence. Accurate laser interferometer measurements can be made without vibration isolation tables, so a minimum of floor space is required. Keeping measurement equipment within the clean room means measurements can be made more often as well, for better quality monitoring with little impact on schedules. 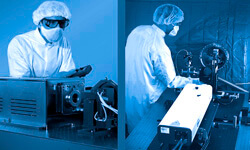 Available at wavelengths from 193 nm to 10.6 microns, 4D dynamic laser interferometers are used daily in cleanroom environments around the world, measuring everything from DUV lithography optics to infrared optical systems. Manufacturers and integrators of space-based optics ensure performance by testing at extremely low pressures and temperatures. Instantaneous measurement with Dynamic Interferometry® technology makes it possible to measure optics in environmental test chambers despite the vibration and turbulence caused by pumps and equipment. Vibration isolation tables are not required, which greatly increases the options for testing setups. 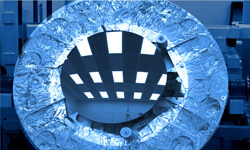 With a wide range of wavelength options, 4D dynamic laser interferometers offer flexible quality control testing in cryogenic environments or other challenging test conditions, for visible and IR optics. Many large telescopes now employ adaptive optics on either their primary or secondary elements to counter the effects of constantly changing atmospheric conditions. The actuators for the adaptive system are typically piezo elements attached to the back of flexible elements. Measuring adaptive optics to understand how they respond to changes in their controlling actuators is critical to excellent performance. In the past, to measure the modal response of an adaptive optic to changes in the actuators, sensors have been used to measure movement at individual points on an optic—a slow, low-resolution solution. 4D PhaseCam Twyman-Green laser interferometers measure nearly instantaneously, so they can image adaptive optics as they are actuated, and verify and calibrate the response of the actuators. Dynamic interferometers show the 3D response of the entire optic, providing a complete image of control system performance. 4Sight analysis software, included with all 4D interferometers, offers a modal analysis option which allows engineers to view the mirror response in real-time and to adjust the adaptive optic system accordingly.